Eagles Flight was an opening-day sky bucket ride that carried passengers from the Sky Tower to one of two stations: El Dorado Station at the northwest side (back) of the park near El Bumpo, and Galaxie Station at the northeast (front) side of the park near the Galaxy ride and, later, the Oasis cafeteria. Patrons had a nasty habit of swinging the buckets in contravention of the posted rules. That came to sudden and violent end in 1978 when a pair of newlyweds swung their bucket too far and it crashed to the ground (see story below). The ride was redesigned; in 1981 the El Dorado course was removed, followed by the Galaxie route in 1994. Like the Sky Tower and several other early attractions, Eagles Flight was fabricated by Intamin AG of Wollerau, Switzerland. "Intamin" is an acroynm for INTernational AMusement INstallations. In 1968, executives of Sea World Inc. were looking for a place in Los Angeles County to build a new theme park. Knowing that The Newhall Land and Farming Company had enough undeveloped land and that the company wanted to attract attention to its New Town of Valencia, a county planner asked company CEO James F. Dickason if he was interested. He was. After intense negotiations, Sea World and Newhall Land formed a $20 million partnership and began to build a 200-acre amusement park at the western edge of Valencia. Seventy acres would be used for the park itself — rides, theaters, games, food, landscaping — and the rest for parking and ancillary services. Construction began Nov. 17, 1969, and continued until opening day. When Magic Mountain's wrought-iron gates swung open to the general public for the first time on May 29, 1971, Southern California's most exciting "white knuckler" experience was the Gold Rusher roller coaster, which careened over the hillsides on its distinctive gold-colored track at a breathtaking 35 miles per hour. Highlights of the day were El Bumpo, a bumper boat ride where patrons navigated gas-powered skimmer craft over a lagoon; Galaxy, a giant, double-armed tilting Ferris wheel; Billy the Squid, a brightly colored ride with huge, revolving tentacles; and the Log Jammer, a flume ride. By the numbers, admission was $5 (just $3.50 for kids 12 and under); the park boasted 500 employees and featured 33 rides, many of which were built by the Swiss firm Intamin AG (Sky Tower, Galaxy, Funicular) and Arrow Dynamics (Gold Rusher). Arrow Dynamics, a Bay Area roller coaster and amusement ride design company partially owned by Walt Disney, had a number of popular Southland attractions to its credit including the Matterhorn Bobsleds at Disneyland and the Corkscrew at Knotts Berry Farm. Magic Mountain lured a remarkably rich lineup of entertainers to its 7-Up/Dixi Cola Showcase Theatre (later known as the Golden Bear Theater) including Barbra Streisand, Bill Cosby, Jimmy Durante, Phyllis Diller, Pat Boone, the Carpenters, Connie Stevens, Mac Davis and Sonny & Cher. In 1978, the rock group KISS used Magic Mountain as the setting of its horrid made-for-TV movie, "KISS Meets the Phantom of the Park" — which became something of a cult classic, even though band members are said to have forbidden roadies from ever mentioning it. Rumors of an acutal phantom that appeared atop hills and caused rides to turn on mysteriously after midnight persisted. Film-goers seemed happier with "National Lampoon's Vacation" (1983), when the park doubled for Walley World. In 1971, the park had secured rights from Warner Bros. to use its Looney Tunes characters. If Disneyland had Mickey Mouse, Magic Mountain would have Bugs Bunny. But it was a short-term deal, and after the inaugural year, the Warner Bros. characters stayed away for more than a decade. So in 1972, Magic Mountain introduced its own lineup of memorable characters: Bloop, Bleep, King Troll (aka King Blop) and the Wizard. Initially the entertainers were union laborers provided through All King Productions, a member of American Guild of Variety Artists; after All King's contract expired Dec. 31, 1972, Magic Mountain brought the entertainment in-house with non-union workers. Troll pay fell to $2.75 per hour from $3.50; at the time, the minimum wage was $1.65. At least one notable park employee who wore the Bleep costume would go on to make a name for herself — Oscar nominee Debra Winger ("Urban Cowboy," "An Officer and a Gentleman," "Terms of Endearment," "Legal Eagles," "Shadowlands"). The actress remembers that it was between Christmas and New Year's in 1972 when she sustained a serious on-the-job injury. Seventeen-year-old Debra was being driven to a location in the park in a Cushman vehicle when she "went out the back end, in costume." According to news reports, she was partially paralyzed and temporarily blinded. Her recovery took many months. (Incidentally, she remembers that Bloop was a nice guy.) Debra's older brother, Marc, would become superintendent of the Newhall School District. Perhaps the incident was an omen of things to come. The 1970s were puncuated with injuries to park employees and patrons alike, all too frequently resulting in death. In January 1978, Theron "Terry" Fowler, a Grand Prix mechanic, died when one of the cars fell on top of him. A 1969 Hart High graduate and an aspiring teacher, Fowler's body was discovered the next morning — by his own father, who had gone to look for him. 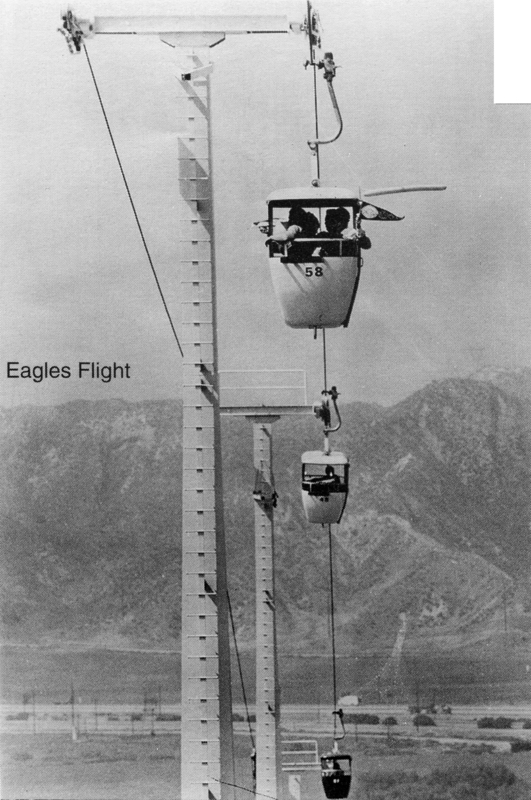 The following month, on Feb. 5, 1978, a pair of newlyweds were violently rocking the Eagles Flight sky ride, causing their bucket to plunge 50 feet to the ground. The husband died and the young bride sustained critical injuries. Later that same year, a 20-year-old woman whose girth should have prohibited her from riding the brand-new Colossus roller coaster was not securely fasted into her seat; she flew out. Next, an 8-year-old child was maimed when he somehow got dragged under the Dragon ride — a low-slung people mover that slowly ferried patrons up the hill to the Sky Tower and Magic Pagoda. Each incident led to dramatic changes. Following Fowler's death, supervisors were required to check employee time cards to ensure they'd punched out at the end of their shift. The Dragon was removed in 1981, as was one of the two separate Eagles Flight courses. Safety features were added to the remaining course, and it, too, was eventually removed. Colossus went through three generations of trains; ultimately they were so secure that in 1984, patrons were invited to ride backward. Understandably, The Newhall Land and Farming Co. wanted out of the theme park business. It was in the business of entitling and selling land, not holding it and operating unrelated companies on that land. Magic Mountain had done its job by putting Valencia on the map. Newhall Land was ready to divest. In 1979, Newhall Land sold the park to Six Flags for $51 million, a profit of just $250,000. At the time, Six Flags operated five other parks around the country and was a subsidiary of the Pennsylvania Railroad. In 1982 the chain was sold to Bally Corp., which sold it for $350 million in 1987 to Wesray Corp., an investor group headed by former Treasury Secretary William E. Simon. Time Warner retained a dominant position as Six Flags went through additional ownership changes and gobbled up more theme parks in the U.S. and abroad. Time Warner emboldened its branding at Magic Mountain with the Batman Stunt Show in 1992, followed in 1994 by Batman The Ride. Superman and other Warner Bros. characters were close behind. Six Flags' expansion came to an abrupt halt in 2004 when the company started to shutter and sell properties to alleviate its mounting debt. Creditors including Bill Gates, who owned 11 percent, were unhappy, and Hurricane Katrina (2005) didn't help. By 2008, the New York Stock Exchange was threatening Six Flags with delisting. The company filed for Chapter 11 bankruptcy protection June 13, 2009, and emerged May 3, 2010, with new management and restructured debt. Six Flags had put Magic Mountain and its water-themed neighbor, Hurricane Harbor (1995), on the block in 2006 but couldn't find a suitor and ultimatly decided to keep them. The twin parks, known collectively as Six Flags California, were profitable even as the parent company was bleeding money elsewhere. To Santa Claritans, the troubles seemed distant. Through it all, from an attendance of 1 million in 1971 to roughly 3 million today, Magic Mountian remained king of the coasters, rivaled only by Cedar Point, Ohio, in a back-and-forth trade-off for the distinction of having the tallest, fastest — and above all, the most — roller coasters in a single park. Since 1971, the Six Flags California parks have consistenly employed more Santa Clarita Valley residents than any other company. It's good to be the king, but it is the king's subjects — a long line of young adults, usually on their first job — who deserve the lion's share of credit for creating more than 40 years of on-the-ground experiences that have kept happy customers coming back year after year. Sources: Six Flags California; "A California Legend: The Newhall Land and Farming Company" by Ruth Waldo Newhall (1992); Dr. Marc Winger and Debra Winger (personal information); Nanette Lagasse Gaither (Terry Fowler information); Patrick Comey (All King Productions information); Six Flags Magic Mountain 25th Anniversary Memory Book (1996, courtesy of Sandy Renshaw Sinner); various financial statements and reports.